Background: Selenium is an essential trace element with fundamental effects on human biology. Trace elements deficiency is not an uncommon finding in autoimmune diseases. This deficiency may be a consequence of autoimmune diseases or may contribute to their etiology. With regard to evidence showing the association between selenium deficiency and generation of reactive oxygen species and subsequent inflammation, reviewing the role of selenium in collagen vascular diseases could help researchers to devise strategies for managing these diseases. Objective: The present study aimed to evaluate the role of selenium and autoimmune rheumatic diseases. Data Sources: PubMed, Scopus, Science Direct, and Google Scholar. Study Eligibility Criteria: All the studies on the use of selenium without any limitations in terms of the preparation method, administration route, or formulation process were included in the study. The exclusion criteria were: 1) Articles published in languages other than English, 2) Administration of chemical and hormonal drugs rather than selenium, 3) Investigation of the effects of selenium on the autoimmune problems in animal models, and 4) Insufficiency of the presented data or poor description of the applied methods. Furthermore, review articles, meta-analyses, expert opinions, editorial letters, case reports, consensus statements, and qualitative studies were excluded from the study. 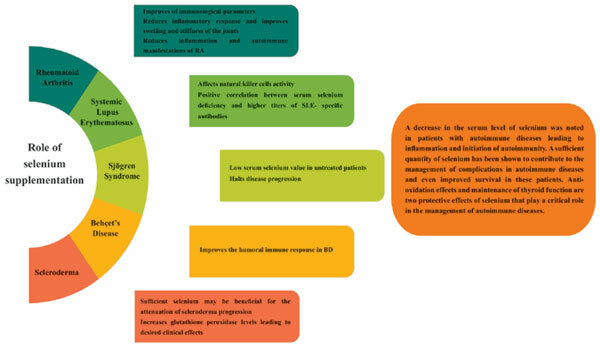 Data Extraction: In this systematic review, articles were evaluated through searching following keywords in combination with selenium: "autoimmune rheumatic diseases "or "scleroderma" or "systemic sclerosis" or "Behcet's disease" or "Sjögren syndrome" or "systemic lupus erythematosus" or "musculoskeletal diseases" or "rheumatoid arthritis" or "vasculitis" or "seronegative arthritis" or "antiphospholipid antibody syndrome". Results: Of 312 articles, 280 were excluded and 32 articles were entered in this study. Based on the majority of studies assessing selenium level in patients with collagen vascular diseases, lower selenium levels were observed in these patients. Moreover, the majority of articles showed an improvement in clinical symptoms of collagen vascular diseases compared to controls after the treatment of patients with different dosages of L-selenomethionine. Conclusion: A decrease in the serum level of selenium was noted in patients with autoimmune diseases, which may be a risk factor for inflammation and initiation of autoimmunity in these patients. A sufficient quantity of selenium has been shown to contribute to the management of complications of autoimmune diseases and even improved survival in patients with autoimmune diseases, which may be due to the anti-inflammatory effects of selenium. Since this issue is of clinical importance, it can be considered in potential nutrition interventions and have beneficial effects on some autoimmune diseases. Selenium, collagen vascular diseases, trace elements, rheumatoid arthritis, SLE, autoimmune diseases.